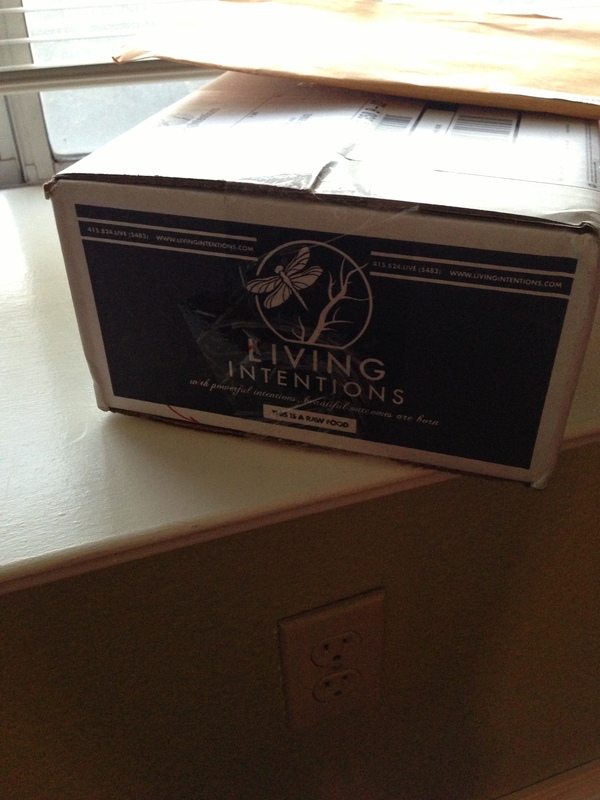 A little while ago, Living Intentions sent me a few of their amazing raw goodies to review!! 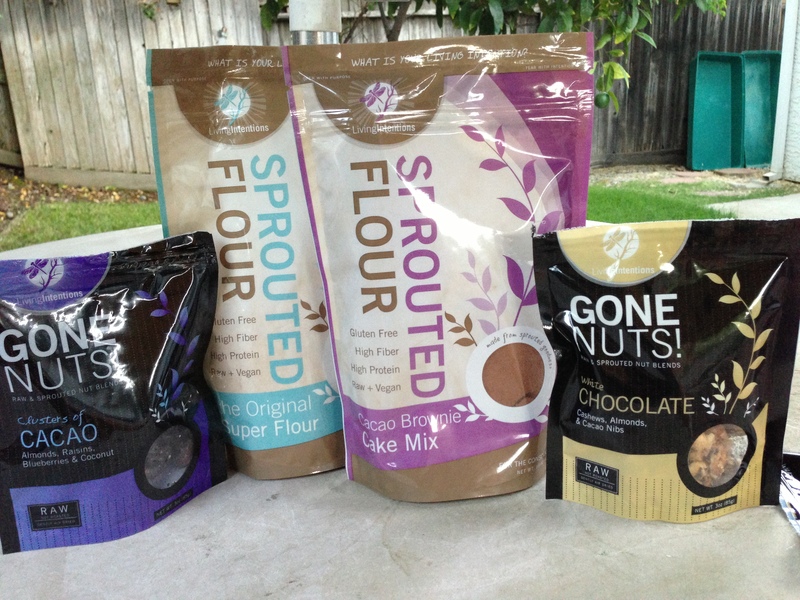 I received a sample of their Sprouted Flour, Sprouted brownie mix, and two flavors of their raw Gone Nuts! 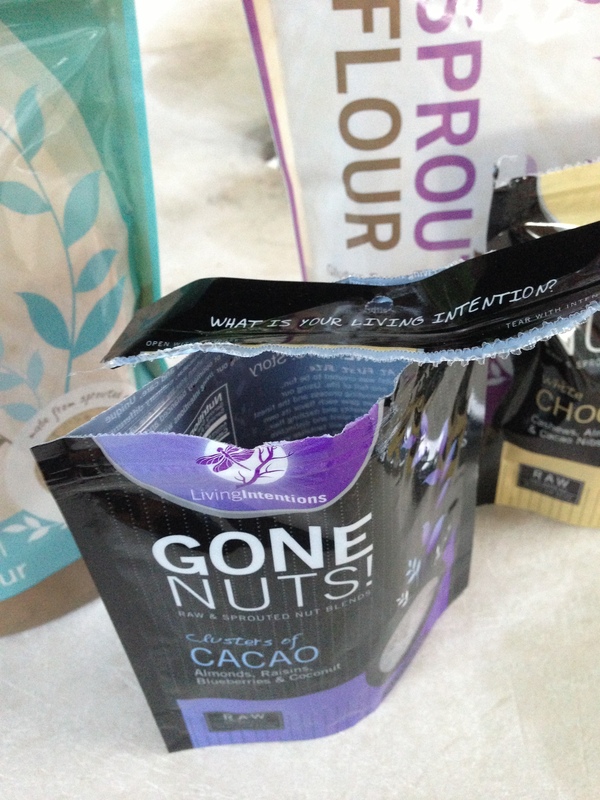 Of course, I broke into the nuts within minutes of opening the package and taking pictures. Oops. These were gone in no time. Ingredients: Organic Raw Cashews, Organic Clear Agave Nectar, Sprouted Almonds (pesticide free), Organic Coconut, Organic Cacao Nibs, Organic Cacao Butter, Himalayan Crystal Salt, Organic Vanilla Extract and Organic Mesquite Pod Meal. The white chocolate nuts were delicious, on their own tasting very coconutty and sweet with a hint of salt, and very much like white chocolate when I put some on top of my breakfast oats:) I am usually not a white chocolate fan -its very sweet, but these were divine! I liked the clusters of cacao even better! Ingredients: Sprouted Almonds (pesticide free), Organic Raisins, Organic Coconut Palm Sugar, Organic Blueberries, Organic Coconut, Organic Raw Cacao, Organic Clear Agave Nectar, Organic Unfiltered Olive Oil, Organic Vanilla Extract and Himalayan Crystal Salt. A smooth dark chocolate coating held together clusters of almonds and dried fruit -it was nutty and fruity and sweet and dark and delicious! 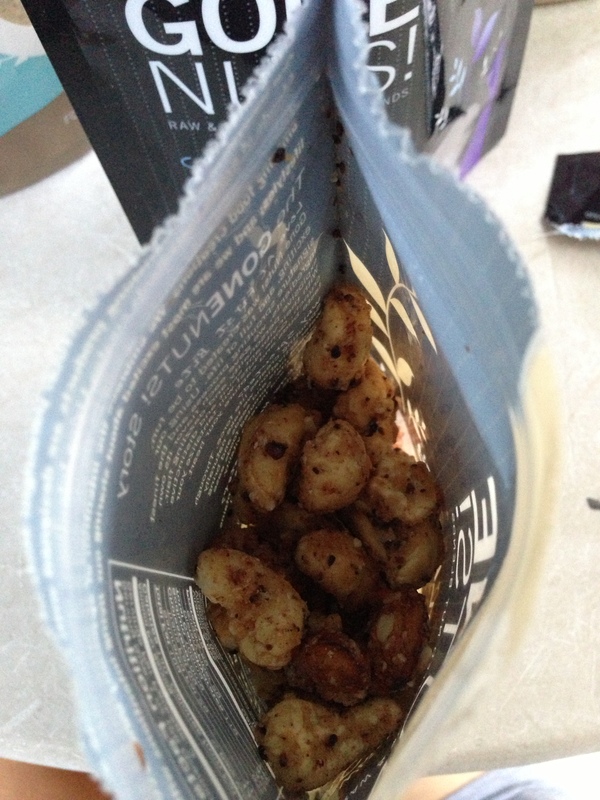 My only complaint was the raisins-simply because I’m not a raisin fan though haha! I usually ‘hide’ my ‘special’ foods (i.e. these nuts) from my stepdad so that I get them all to myself….buutttt I found out after getting these that he knows where my hiding place is. AKA its a good thing I tried them first! Haha I will definitely be trying more of their Gone Nuts! line! 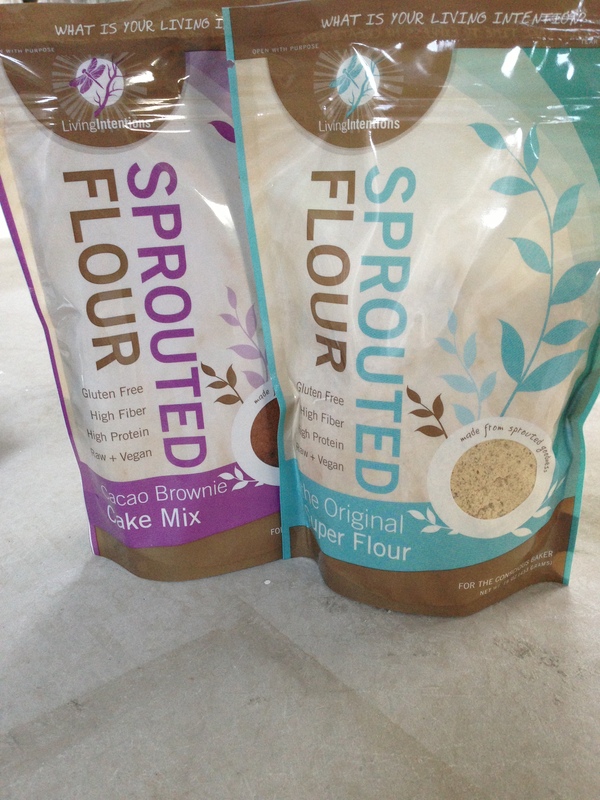 Next up were the sprouted flours- which I was super excited about!! 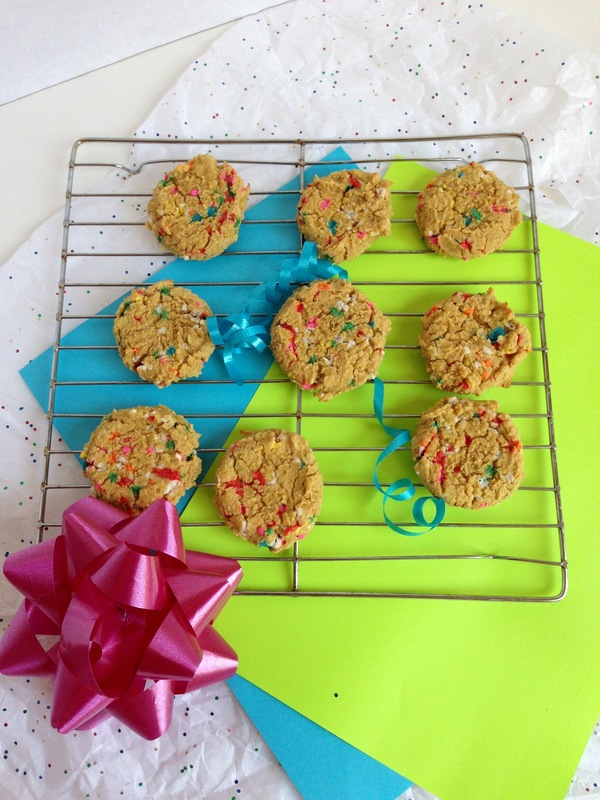 I decided to try each of them in both a cooked and a raw recipe, to see how they turned out!! Both brownies were very rich and chocolatey, however the mix does have a strong maca aftertaste in both desserts, which took away a bit from the chocolate in my opinion. Other than that I did enjoy the brownies! 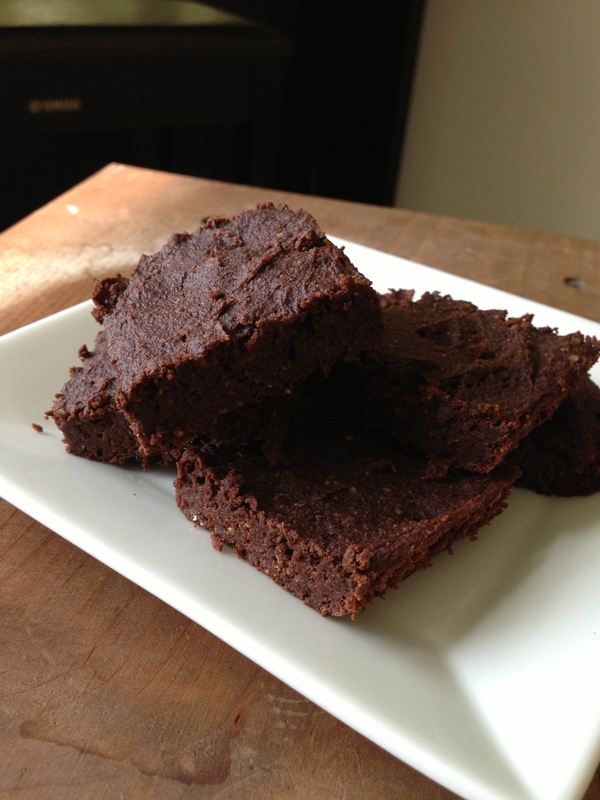 And they have such better, higher quality ingredients than almost any other brownie mix I’ve seen! Low sugar too! Ingredients: The Original Sprouted Super Flour (Organic Sprouted Buckwheat, Sprouted Almonds (pesticide free), Organic Mesquite Pod Powder, Micro-Fine White Chia Powder and Agave Inulin), Organic Cacao, Organic Coconut Palm Sugar, Organic Raw Sun-Dried Cane Juice Crystals, Organic Coconut Flour, Organic Coconut, Raw Brown Rice Bran & Germ, Organic Maca Powder and Himalayan Crystal Salt. And last but most certainly not least, was my favorite product of the package! 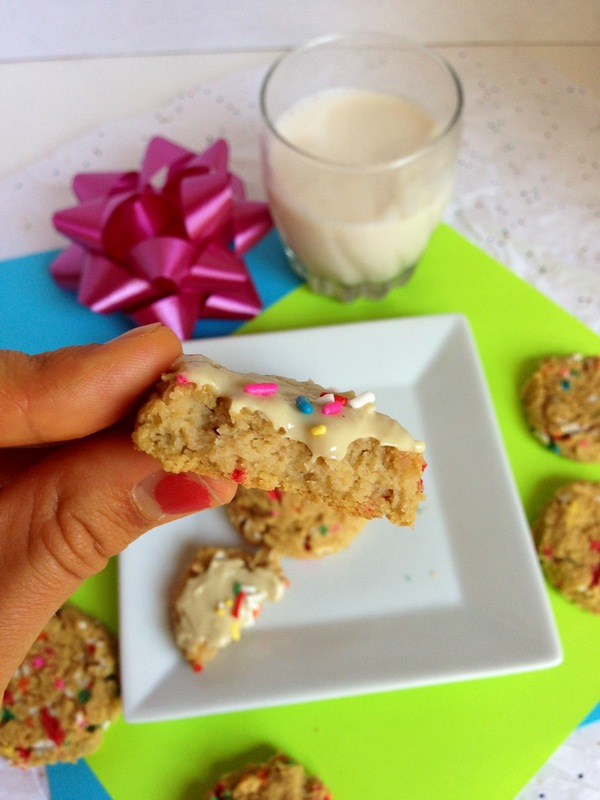 The raw Super Flour! Ingredients: Sprouted Organic Buckwheat Flour, Sprouted Almond Meal (pesticide free), Organic Mesquite Pod Powder, Micro-Fine White Chia Seed Powder, and Organic Agave Inulin. 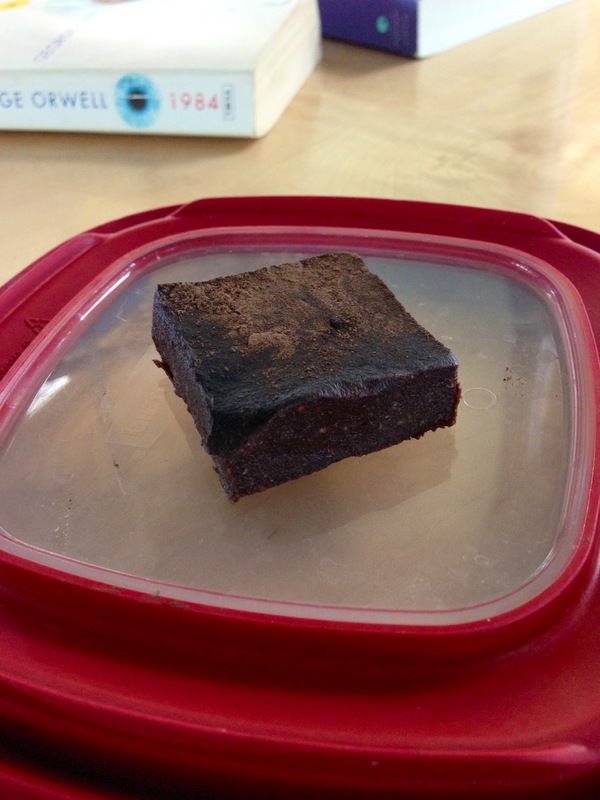 Made out of sprouted grains and super foods-it was slightly sweet and delicious -I could eat it by the spoonful. 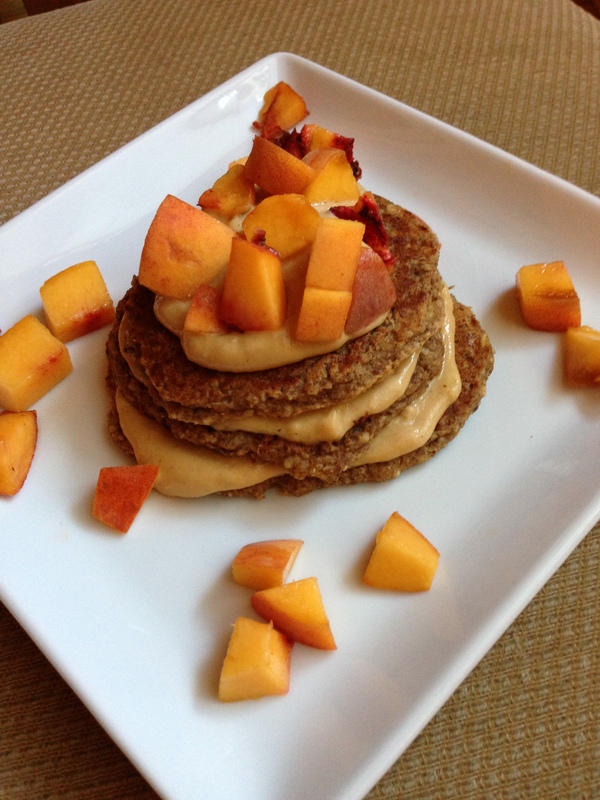 First I made a batch of almond-peach pancakes, and they were divine! The super flour had a wonderful taste and texture-the almond meal in the flour gave these pancakes a ‘crunch’ , taking pancakes to a whole new level!! 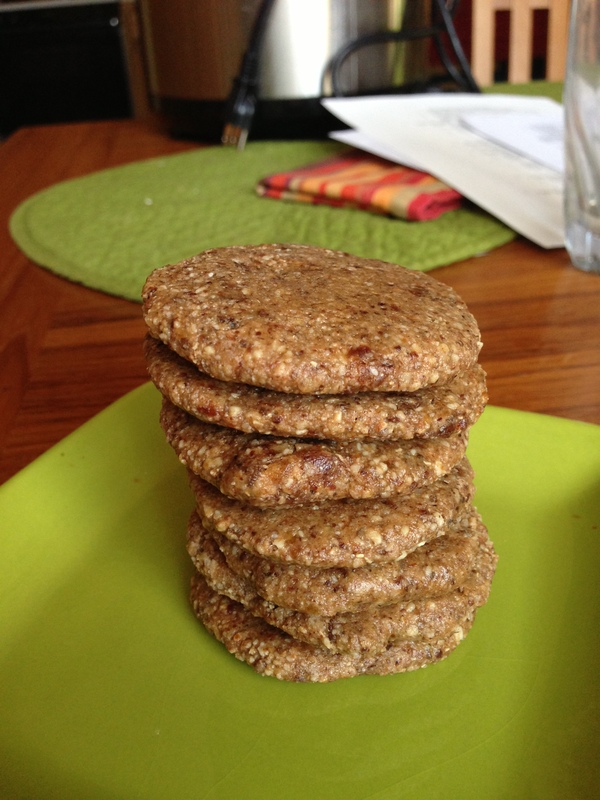 I followed the recipe on the back of the package for their raw ‘oatmeal’ cookies, using almonds instead of walnuts and adding some ginger, then I dehydrated these for a few hours. Oh my goodness were these amazing! 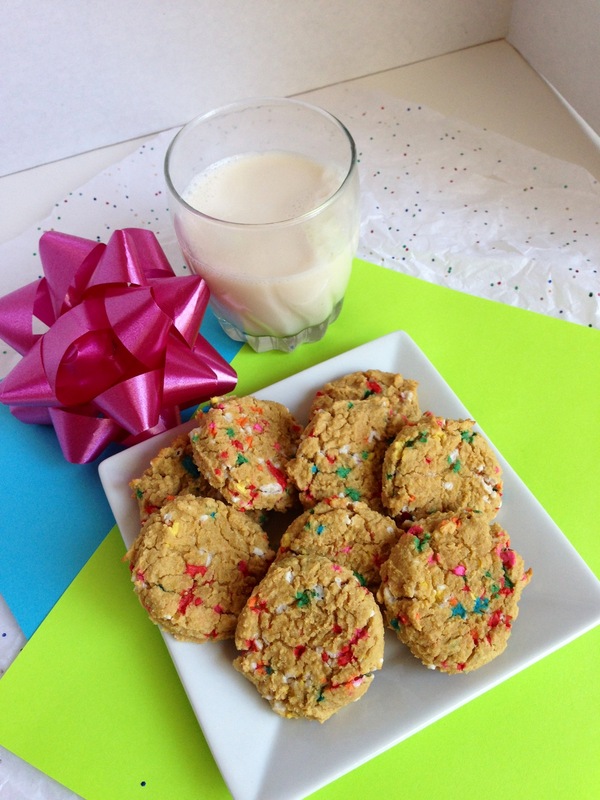 They tasted like actual oatmeal cookies, but with the ginger they also tasted like gingersnaps! 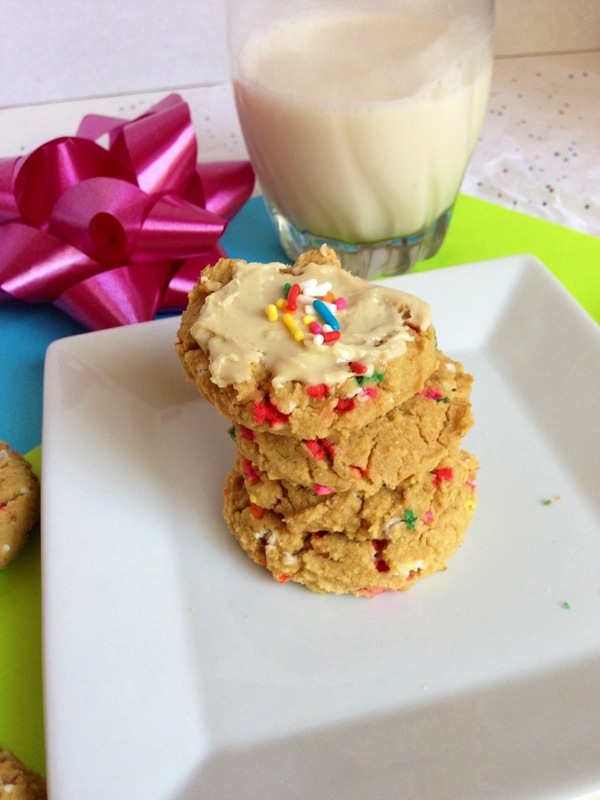 I would so make these again! 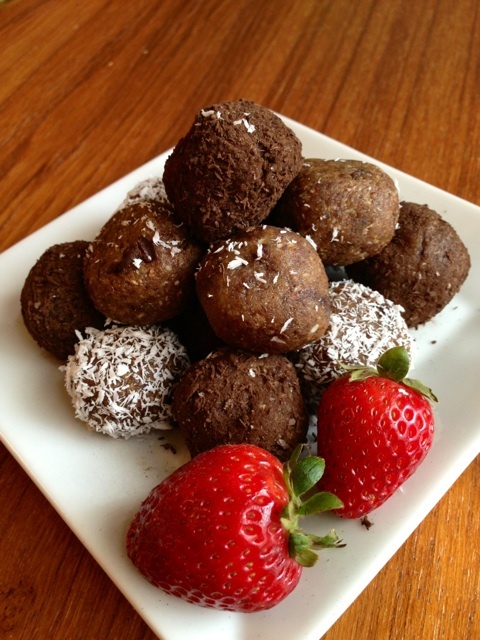 For (almost) raw cookie dough truffles -but you’ll have to wait for another post for the recipe!!! 😉 Can I just say these were awesome though? 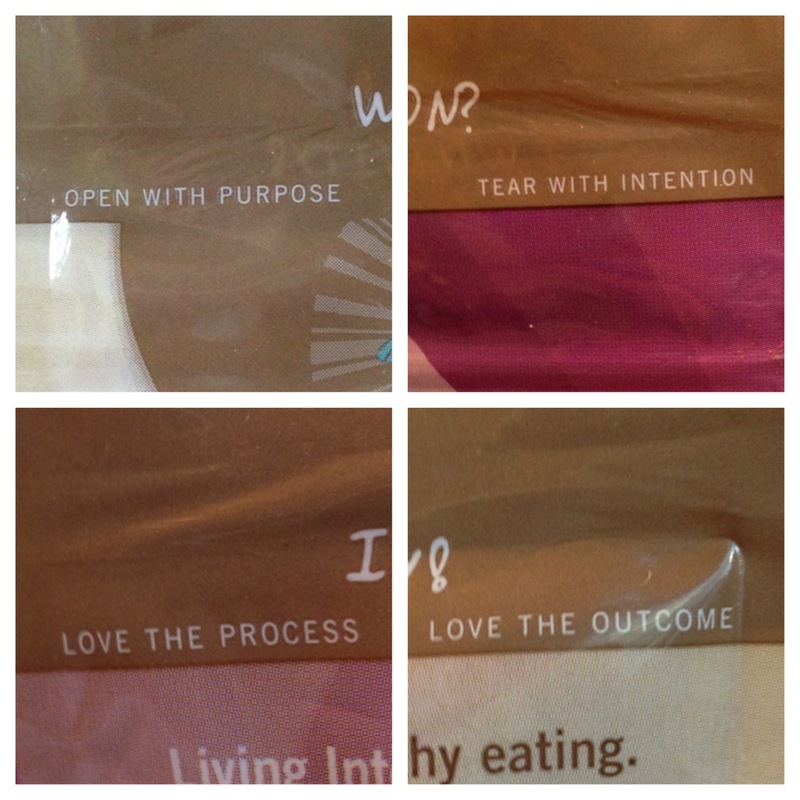 In all, I loved my samples from Living Intentions -even the packaging! Basically my mantra when cooking. I can’t wait to try out more products from this amazing company! 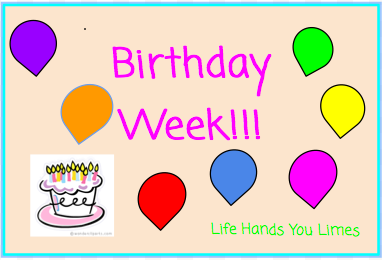 Thanks Living Intentions! So I’ve made Ice Cream, I’ve made a milkshake, I think its about time to turn on the oven!!! These cookies are the best ever. I’m serious. 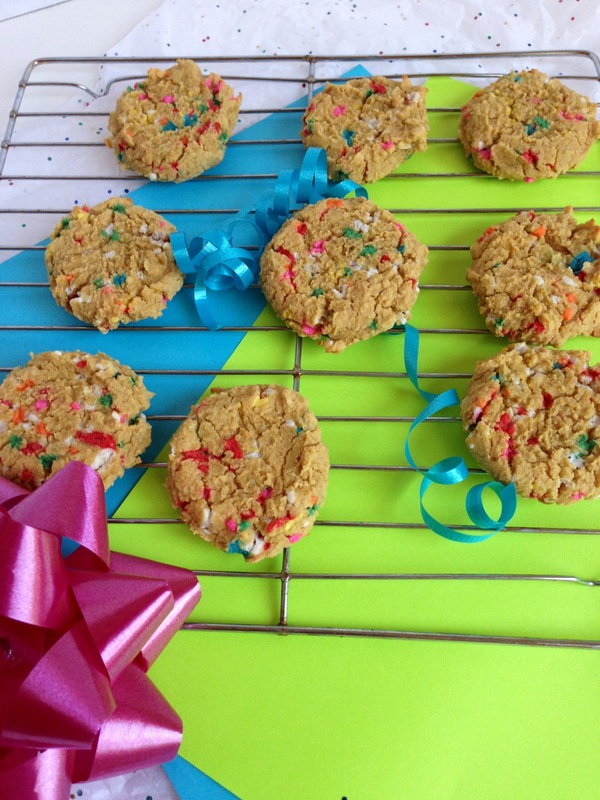 Even if they weren’t funfetti (that makes them super amazing because sprinkles. ), they are still the best ever! You know why? 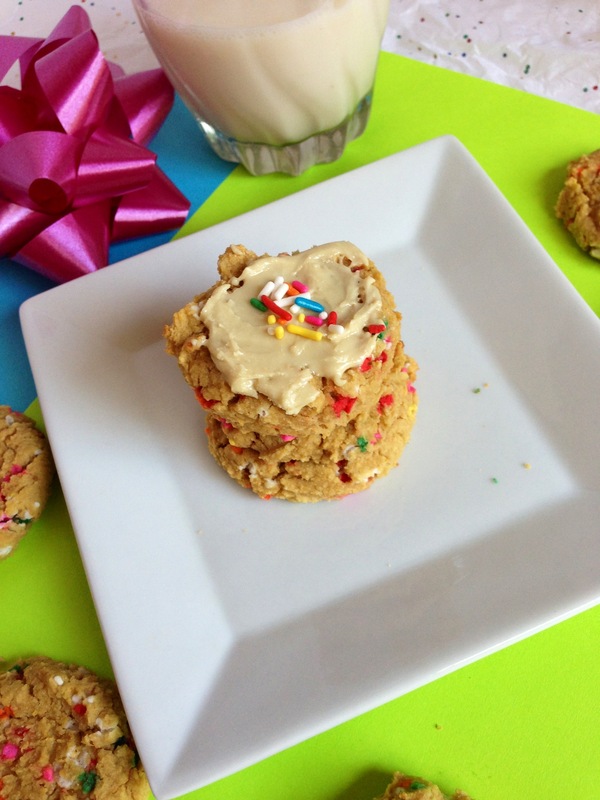 They have a secret ingredient that makes them the softest, fluffiest most delicious cookies ever. You wanna know the secret??? 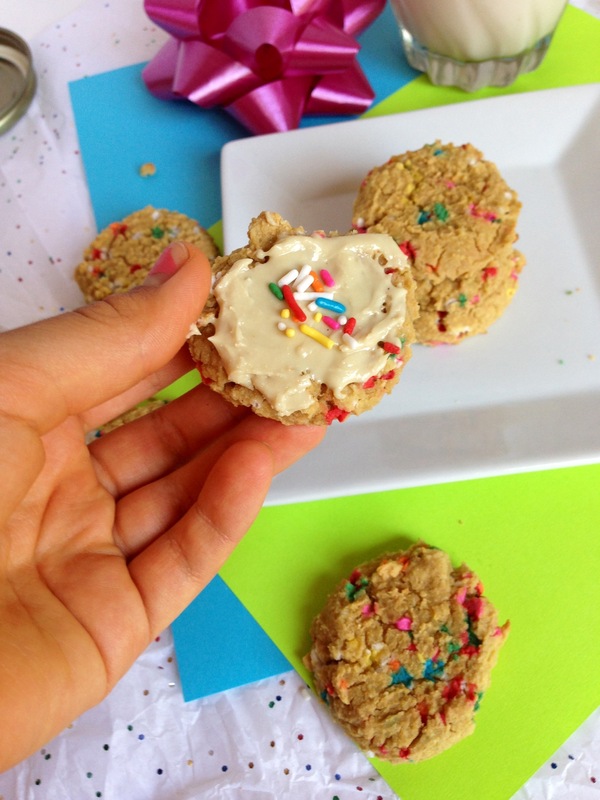 So I decided to make funfetti cookies, using cashew butter for it’s sweet, buttery, frosting flavor, vanilla and almond extracts, and of course, SPRINKLES. Duh. Preheat oven to 375. 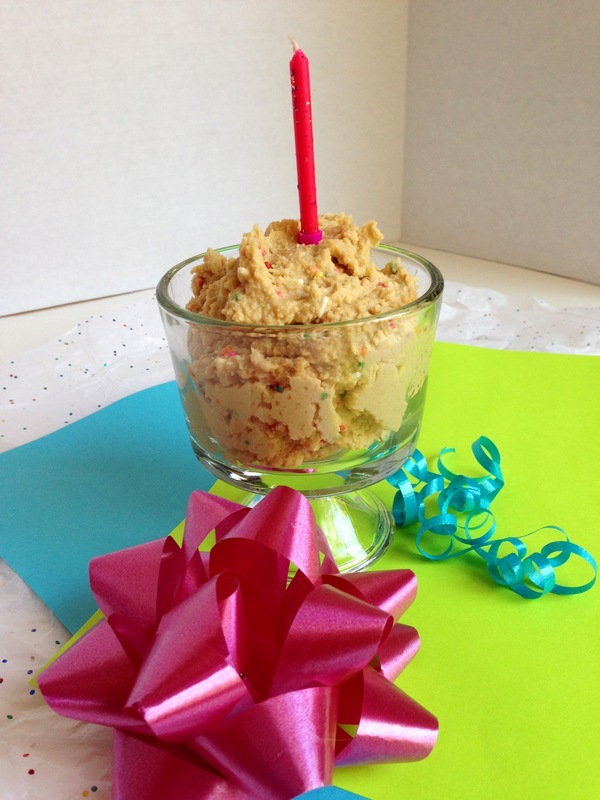 In a food processor, blend everything (chickpeas through salt) together. 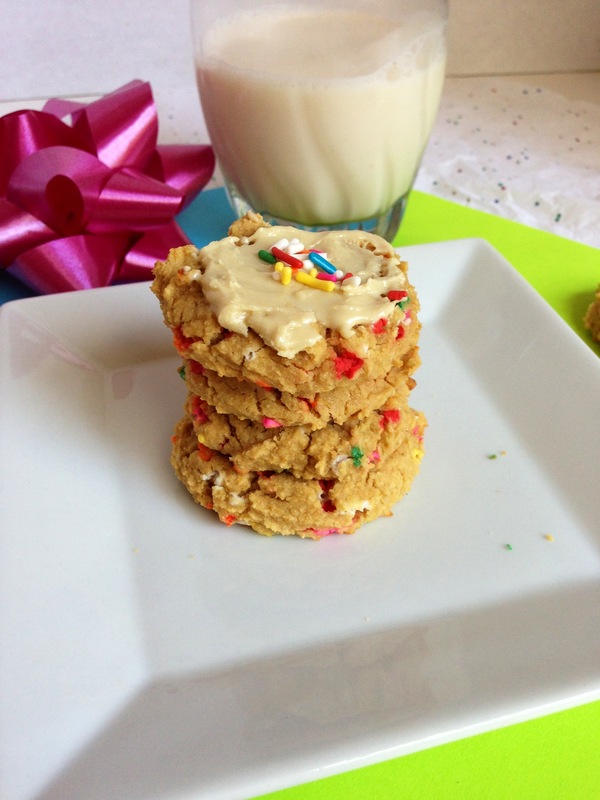 Add almond milk, 1 Tablespoon at a time, until smooth (think hummus) but not too sticky:) adjust your sweetener to taste, add sprinkles and…. 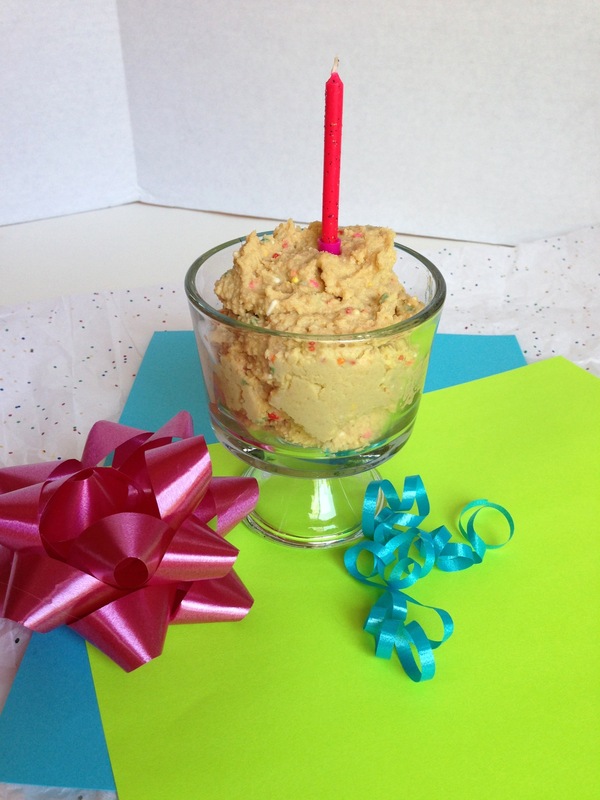 You know, you could stop right here:) Its really delicious as Funfetti dip!! LOOK AT THAT!! look at how soft and delicious it is!!! Dare I say…moist? (well do you have a better word? Succulent? ew. no.) It reminds me of those soft sugar cookies with the addictive pink frosting from the grocery store. No, the cookie part tastes better, but you know how soft those things are??? Yeah. I bet these would be awesome as an ice cream sandwich with Birthday Cake Ice Cream🙂 Or crumbled on top of a Milkshake.